70% cotton/30% polyester with 100% cotton 32 singles face yarn, 10 ounce fleece for supreme printability and softness. 1x1 rib cuffs and waistband. 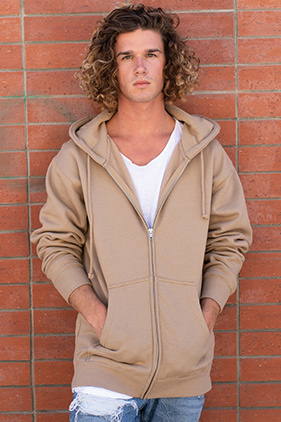 fleece lined hood. Heavy gauge drawcord. Nickel eyelets. Matching twill neck tape. #5 nickel kissing zipper. Double-needle split stitched sewing on all seams. Front pouch pockets. Generous fit for ultimate comfort. Tear away neck label. Camo Colors: 75% cotton/25% polyester with 100% cotton 32 singles face yarn (Forest Camo), not made of 100% cotton face yarn.